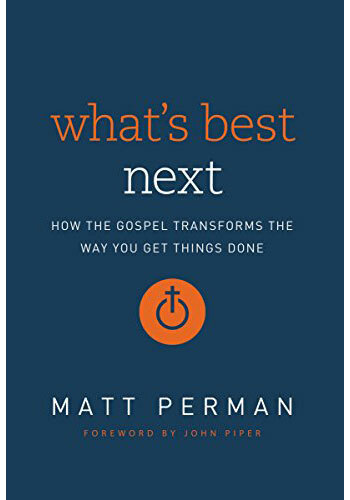 What’s Best Next provides the proper framework and motivation to drive your productivity––seeking the good of others and the glory of God. See how the things you do each day relate to God’s purposes, and learn a practical approach for improving productivity in every area of your life. Productivity isn’t just about getting more things done. It’s about getting the right things done—the things that count, make a difference, and move the world forward. In our current era of massive overload, this is harder than ever. So how do you get more of the right things done without confusing mere activity for actual productivity? When we take God’s purposes into account, we see that the way to be productive is to put others first—to make the welfare of others our motive and criteria in determining what to do (what’s best next). As both the Scriptures and the best business thinkers show, generosity is the key to unlocking our productivity. It is also the key to finding meaning and fulfillment in our work. What’s Best Next will give you a practical approach for increasing your productivity. Buy the book at Amazon, the WTS Bookstore, Barnes & Noble, or your local Christian bookstore. Links to all the reviews on the book and interviews I did. Take your church, ministry, business, or non-profit through the book! WTS Bookstore is often the best place to buy in bulk. Post about the book on Twitter and link to the Amazon page. Post about the book on Facebook and link to the Amazon page. Write a review at Amazon. For readers of the book (or anyone else), you can also check out the Online Toolkit. Here’s the toolkit I mention in the book.